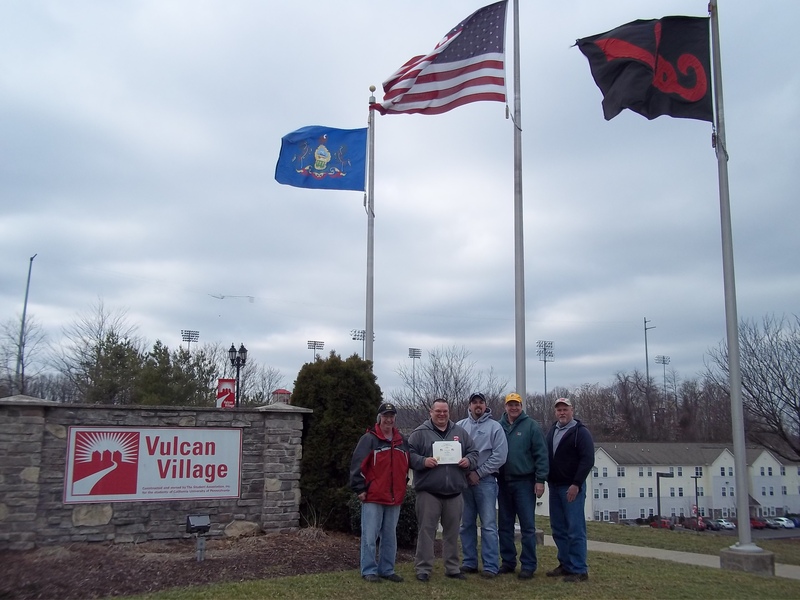 The Flag Award was presented on Tuesday, February 12, 2013 to Vulcan Village in California, PA. Vulcan Village is California University of Pennsylvania’s upper campus apartment community, which houses up to 768 students. The Flag Certificate authorized in 1987 by the Society of the Sons of the American Revolution is presented to individuals, companies, and government agencies that fly the United States flag for patriotic purposes only. Presenting the award on behalf of the George Washington Chapter of the Sons of the American Revolution is Larry Ridgway (left). Attending the ceremony from the Vulcan Village staff are Dr. Scott M. Helfrich, Jeremy Hodge, Spandy Zemany, and Richard Morris.